Over the course of their more than thirty years of marriage, Thomas and Sarah (Bonar) Kirk had thirteen children. Of their eleven children who lived to adulthood, nearly all have been traced in the existent genealogical record: spouses have been identified; descendants traced forward in time; and birth, marriage, and death dates pinpointed. However, there is one elusive exception: a single daughter, Sarah Kirk, managed to slip through the cracks and into the black hole of record-keeping. Unsourced Kirk family genealogies long attributed a daughter named Sarah to Thomas. Only one record confirmed this claim. Following Thomas' death in 1846, each of his surviving heirs inherited a portion of his Licking County, Ohio farm. 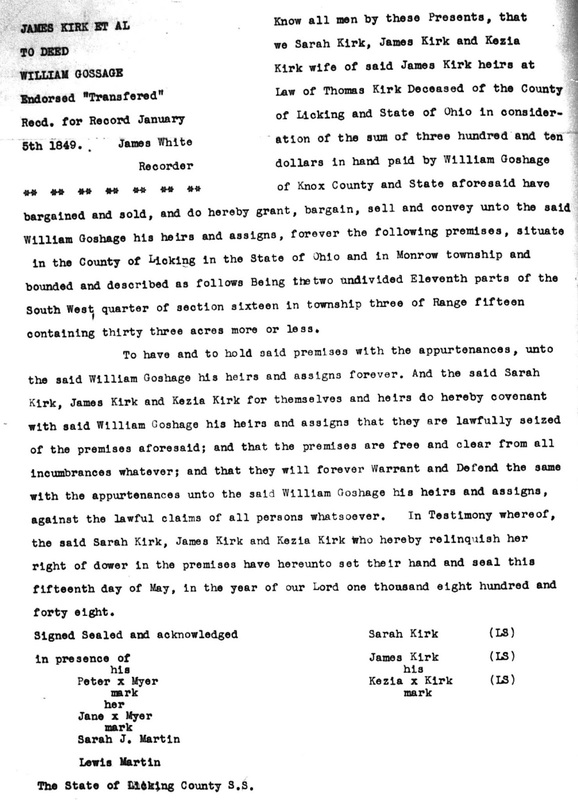 Beginning in 1848, a quitclaim was finalized with a single buyer by the name of William Gossage. The agreement stipulated that Thomas' children - legal heirs to his estate - would convey their inherited portion of his farm (16.5 acres each) in a series of endorsed land transfers. 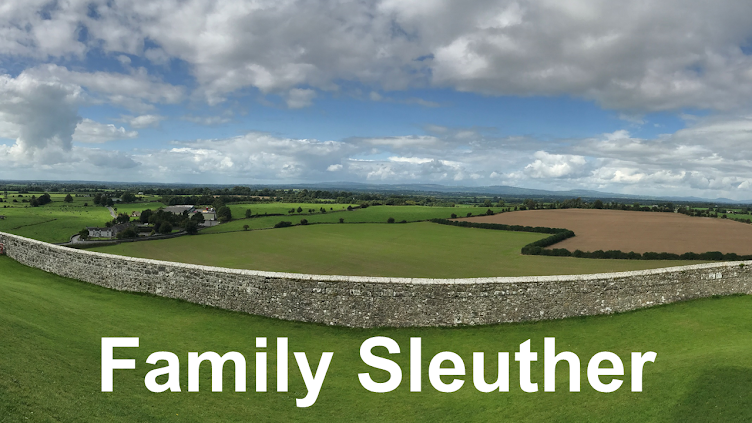 Thomas had thirteen legal heirs: ten living children who each received 16.5 acres and three minor children of his eldest son, who pre-deceased Thomas in 1832, each split a single 16.5 acre share. Besides providing a timeline for when Thomas Kirk's estate was settled (important because his probate file was destroyed in a courthouse fire), the quitclaim land transfers identified each of Thomas Kirk's surviving heirs. This was particularly important for his daughters. Sarah Kirk, the long-rumored daughter, was confirmed in an endorsed land transfer dated May 15, 1848. Both a Sarah Kirk and James Kirk (and his wife Kezia) each sold a 16.5 acre plot, indicating that Sarah was a full-fledged child and heir of Thomas Kirk. This record also suggested that she was unmarried and still using her maiden name. After the land was sold, Sarah disappeared. There are many possible explanations. Perhaps she married and her surname changed to her husband's. Maybe she passed away before death records were kept and her death was lost to time. Or it was possible she remained single, moved away, and evaded discovery. The obvious ideas were to follow her siblings and see if she stuck with them. Many of her siblings traveled west and settled in Crawford County, Illinois. I couldn't find her with them. She doesn't appear to be with her two siblings who remained in Licking County, Ohio, either. Who was Sarah Jane Kirk? 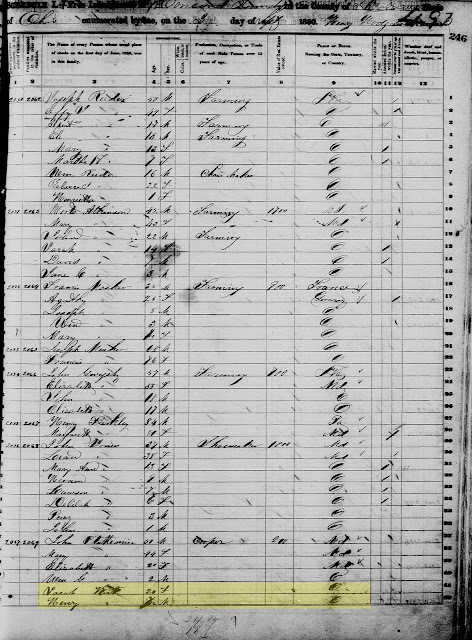 Thankfully, I could turn to the 1850 census - which was the first US Federal census that enumerated everyone, not just the heads of household. Was Sarah still unmarried and using her maiden name? I found a person of interest. 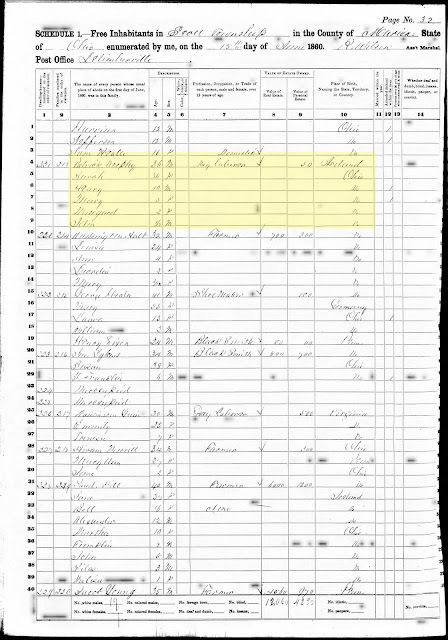 In 1850, a 26-year old Sarah Kirk was enumerated in the census with a three-month old son named Henry. They lived with John and Mary Stottlemyer (Ancestry transcribes the surnames as Pluttemire, and FamilySearch transcribes the surname as Ptathemire). What was Sarah Kirk's relationship to this family? Was Henry her child (the census certainly suggests so)? Was she married? Was Kirk her married or maiden name? Just two years later, a Sarah Jane Kirk appeared in Delaware County records. Sarah Jane Kirk was getting hitched to Patrick Brophy on December 9, 1852. Was the 1850-enumerated Sarah Kirk the same as the 1852 Sarah Jane Kirk? The answer came, I believe, on the next census. 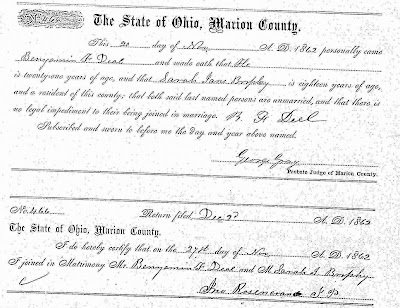 Eight years later, Patrick and Sarah Brophy had moved north to Marion County, Ohio where they were enumerated in the 1860 US Federal Census. At ten years old, Henry was born in 1850 - two years before Patrick and Sarah Jane's 1852 wedding. It seems quite likely that this was the Henry Kirk who was enumerated on the 1850 census with Sarah Kirk. It seems Sarah Kirk was Sarah Jane Kirk. Did Patrick Brophy adopt Henry as his step-son? Or was Patrick Brophy the biological father and Henry was born out of wedlock? Twelve years later, the Brophy family experienced some unexplained tumult. On November 27, 1862, Sarah Jane Brophy married Benjamin F. Deal (or Deel? or Diel?) in Marion County. What happened to Patrick Brophy? Did he pass away? Perhaps there's a surviving probate record for him in Marion County. Ancestry has probate journals for 1852-1869, but they're not indexed. I need to trawl through these for more clues. Sarah Jane's new husband certainly wasn't offering many insights of his own. In June 1863, Benjamin F. Deal of Marion County appeared on a list of men subject to military duty. The National Parks Service's Civil War Soldiers and Sailors database includes a Benjamin F. Deal (aka Deihl) who served with the 30th Regiment of the Ohio Infantry. Was this the same Benjamin from Marion County? The trail soon runs cold here. I cannot find Sarah or Benjamin in the 1870 census. What happened to them? Even tracing the Brophy children (Henry, Mary, Margaret, and John) has been difficult. 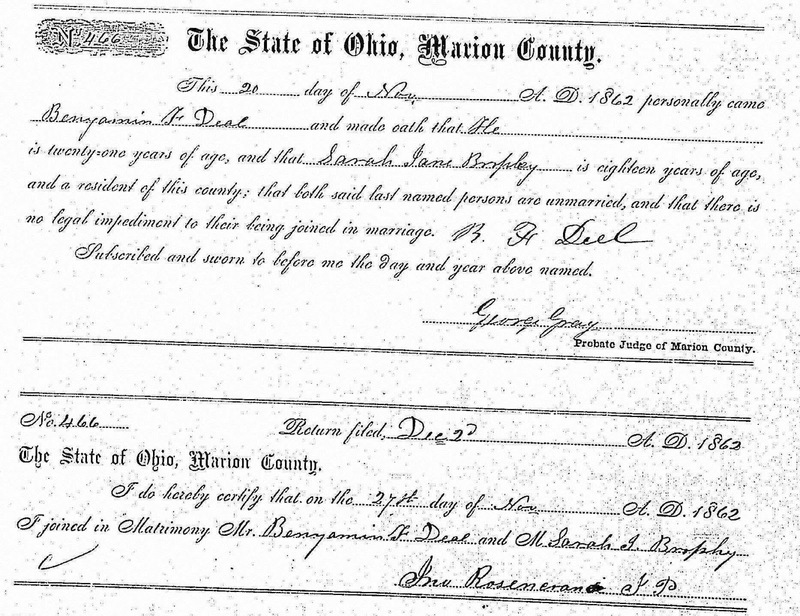 A 1932 Ohio death record for a man named John Brophy doesn't make the task any easier, with the entry for the decedent's parents marked unknown. If I could locate a living descendant of this John, I could explore whether there's a genetic match that would hint at a family relationship. But, until then, I'm left puzzling whether Sarah Jane Kirk Brophy Deal was the daughter of Thomas Kirk. Where else should I look to carry this research forward and pin down Sarah Jane Kirk's origins? I assume that you looked in the Delaware County 1850 census for Patrick Brophy, or any Brophy family? This is one of those cases that slips between the ten-year wide cracks between census, isn't it? Unfortunately, Vera, there was no Patrick Brophy or any other Brophys in Delaware County in 1850. Surprisingly, the surname was more common than I anticipated. There are Brophys in neighboring counties, but no Patrick. Good idea, Cathy. I'll have to reach out to the county courthouse and see what, if any, additional more detailed items survive in their records. I assume this couple did not appear on the 1870 census or any thereafter, or you would have said so. No, unfortunately, I haven't found Sarah or Benjamin in the 1870 census or any afterwards. The surname Deal (or even the alternate Deihl) are quite common.